God, this is a great record. 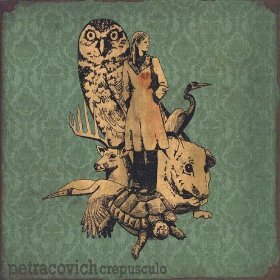 I knew of Petracovich aka Jessica Peters for some time now. Fellow reviewer Anna Maria had written her up here before. But same old story: I have too much music to go through already, I rarely get to pick up something new that I’m not expected to review. So I’m thankful that this finally came across my desk. That tinkly playful piano that opens the disc gets me every time. Then when the rest of the instruments come crashing in I almost get chills. You can’t not feel joy when hearing this. It’s not a happy song (“I’ll make you love me then I’ll leave you all alone…”) but it sounds joyful. I love that disparity. Peters’ voice is gorgeous and very comfortable. Also fun to sing along with. Syracuse Next 6 Exits is beautiful. More tinkly piano and it reminds me of snow. San Rafael is probably my favorite. It’s simply gorgeous and the melody haunts me. As a matter of fact, I’m pretty sure all these melodies have come to me in my sleep in the past few months. This album has gotten under my skin. In such a good way.